Meatloaf has been a point of contention between my husband and I for quite some time. You see, it all stems back to Mom — both his and mine. This is one of those classic “That’s not how my mom did it” arguments. They make meatloaf quite differently. My mom made small rounded loaves, with barbeque sauce or ketchup on top. No breadcrumbs, and no cayenne. Nick’s mom made a loaf, sliced it, and then each person could put whatever sauce they wanted–ketchup, A-1, bbq, etc–on their serving. With breadcrumbs, and I don’t know about the cayenne. We’ve struggled with this issue for years. We finally gave up and took meatloaf off the menu. This is kind of horrifying. Mostly revolting looking. Not appetizing. At all. Ok, but how did it taste? Surprisingly, pretty good. Like meatloaf ought to. Meaty, kind of boring, easy to throw together and kind of homey and comfortable. 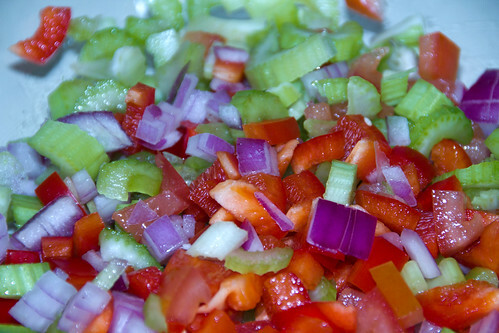 Half of a tomato (seeded), half of a red bell pepper, 3 stalks of celery and about 1/2 cup of chopped onion. 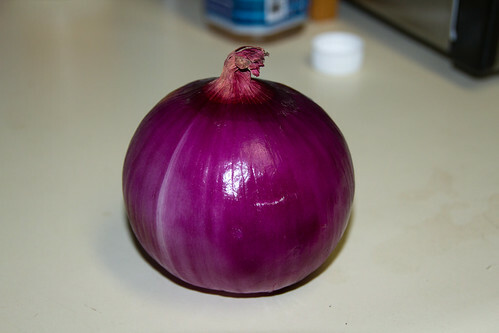 The onion was so pretty! Is it weird that I thought the onion was pretty? In a large bowl, I combined all the vegetables with a pound of ground turkey, one egg white, 2 teaspoons of Worcestershire sauce, 1 teaspoon of cumin, 1 teaspoon of paprika, and a little less than 1/2 teaspoon of cayenne. 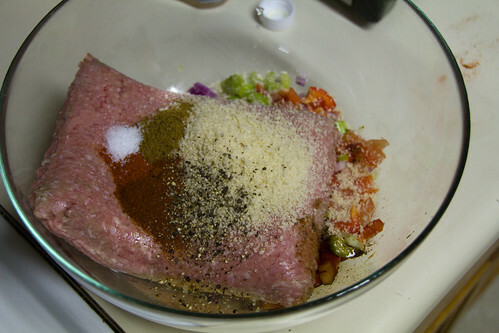 There was also 1/4 cup of panko breadcrumbs, 1/2 teaspoon of salt and 3/4 teaspoon of ground pepper. The next part is kind of fun. Don’t bother trying to use a spoon or spatula to mix everything. Just dig in (with your very clean hands) and squish everything together. 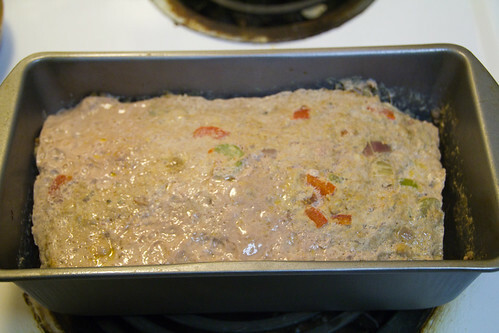 Next, put the mixture in a greased loaf pan, cover with tin foil and pop that into the oven that’s been preheated to 350F. And then you wait. For at least an hour. It goes together quickly, but then it takes forever to actually cook it all the way through. 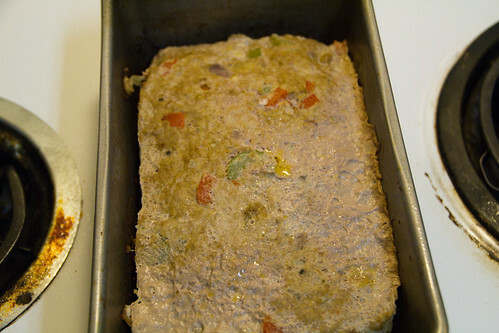 When I pulled it out the first time, upon removing the tinfoil, I was shocked to find that the meatloaf had shrunk, and was now sitting in a giant puddle of yucky goo (yes, that is its scientific name. Why?) I carefully dumped the yucky goo out of the pan (I didn’t have the heart or the stomach to take a picture of said goo. 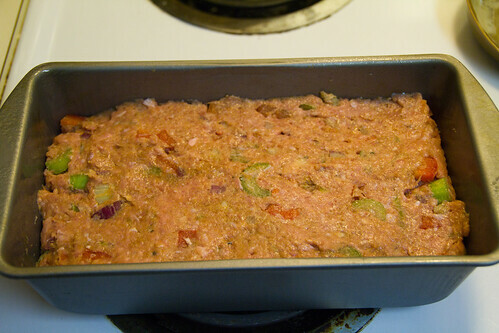 See the first photo for how it looked after dumping) and promptly put the meatloaf back in the oven. Here’s how it looked the second time around. Slightly better, I’ll admit, but I wasn’t hopeful that it was going to be cooked through. When I sliced into it, however, the results were promising. Now that is something that I could (and did) eat. What I liked the most about this recipe is that I didn’t have to add any fat such as vegetable or olive oil. If you’re looking for some serious protein, this is the recipe for you. Upon further contemplation of the yucky goo, I realized that it wasn’t all turkey fat. There is quite a lot of moisture in uncooked vegetables, and it will cook out if you leave them in the oven for an hour. I imagine that if I gently sauteed the vegetables for a bit before mixing them with everything that they wouldn’t release so much moisture during cooking. 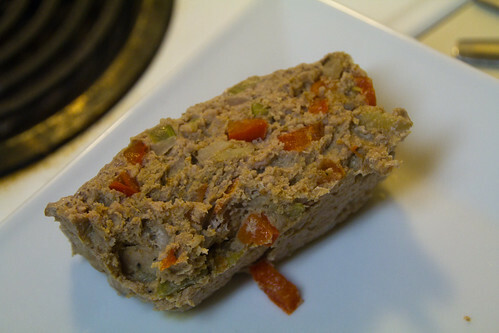 That made me feel better, but I’m still not sold on the loaf part of meatloaf. How about you? Are you a staunch loafer? Or would you rather have something more like a rounded patty? Would you fight to the death for your mom’s recipe, or would you be willing to try something new? Feel free to battle it out in the comments! 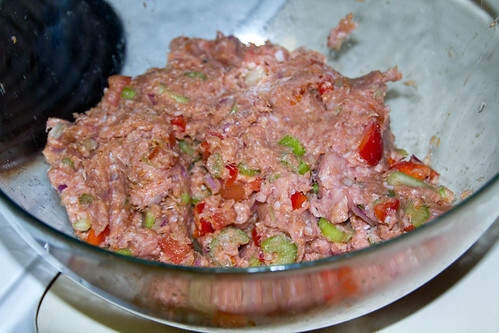 I never really liked meat loaf till I found the “Busy Day Individual Meatloaves” recipe. I love the fact that they cook in 30 minutes and the grease from the burger drains off and away from the loaves. I always left some without BBQ Sauce for those Ketchup lovers or those who liked theirs plain. Keep up the good work, you do a very nice job on your photos and your blog.